In his work, Chladni provides a comprehensive list of masses of meteoritic iron and stone that were known to have dropped from a fireball. In the following Chladni uses these examples for a determined defense of his theory that these masses are not as believed of atmospheric but in fact of cosmic origin. 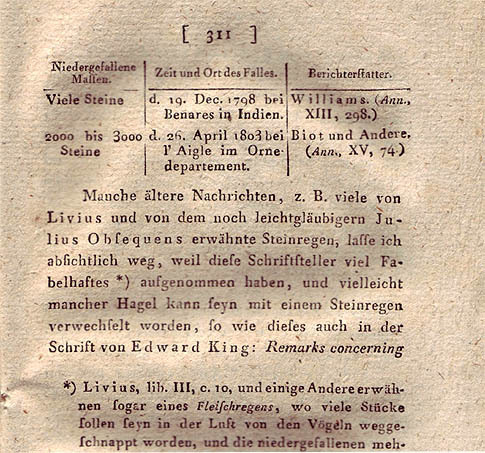 Apparently his earlier work from 1794 in which Chladni first had claimed the cosmic origin of stones and irons had been repeatedly attacked by the scientific community, especially from leading authorities in France and Britain. What is so remarkable about this work of Chladni is the fact that it was published in spring 1803. The L’Aigle fall, which was about to change the view of the meteoritic world completely, had just happened in this very year 1803 in April. The event is already included in Chladni’s table (see image above). Biot’s report to the Academie Francaise had just been issued and we can assume that at that time it was already known to Chladni. Certainly Chladni took the opportunity of the L’Aigle fall to call his theory into memory. Particularly into the memory of those scientists which had so stubbornly refused to accept his ideas and of which one had assumed that “someone who speaks out such ideas may have been hit by such a cosmic stone on his head”. 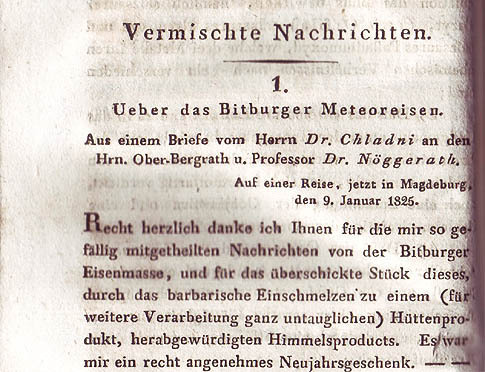 Chladni’s letter from 1825 on the Bitburg Meteoritic iron gives some additional insight to the matter, while in the same volume Dr. Noeggerath and Dr. Bischoff already provide a thorough historical and chemical analysis of the find circumstances and the meteoritic iron itself. Chladni harshly criticizes the ‘barbaric act of smeltering’ the meteorite has suffered. He continues in comparing texture and composition to other known meteoritic irons of the time and repeats his conviction that the material is indeed of meteoritic origin. Although due to the artificial reheating no Widmannstaedten pattern is visible, Chladni clearly states that some of the octahedric structure has remained within partly melted fragments. Chladni’s role in the discovery of the meteoritic nature of the Bitburg iron must not be underestimated. 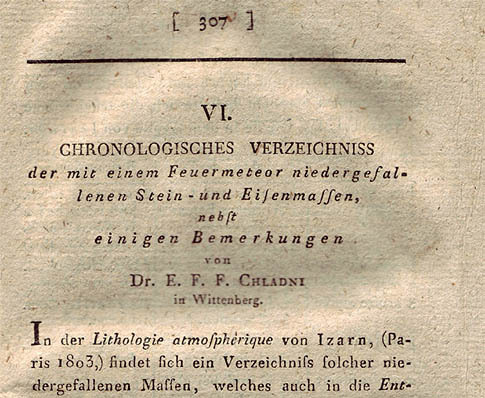 Already in 1821 in ‘Gilbert’s Annalen der Physik’, page 342, Chladni had claimed ‘that the questioned iron mass is without any doubt of meteoritic origin’. This judgement was finally confirmed when Bischoff and Noeggerath in 1825 published the results of their chemical analysis. Ferdinand Keller, Zürich 1838. 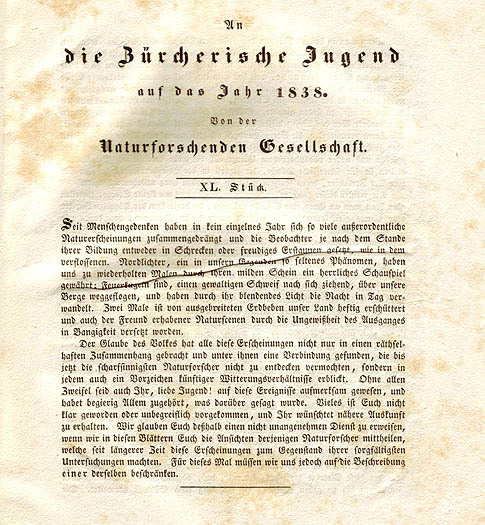 In: An die Züricher Jugend auf das Jahr 1838 – Von der Naturforschenden Gesellschaft. XL. Stueck. 9 pages With one lithographic plate. 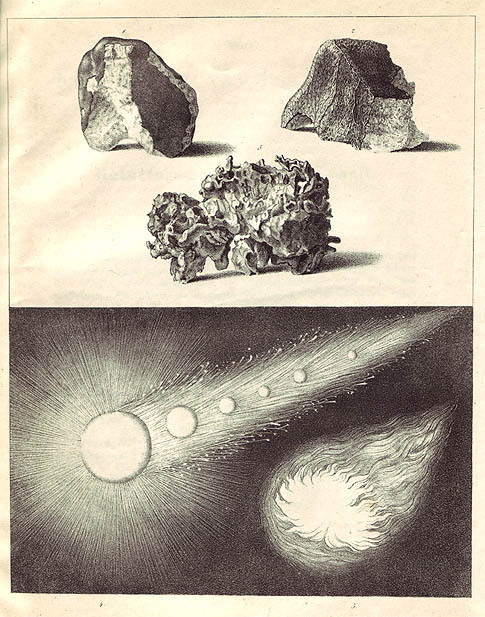 Early Swiss compilation on meteoritic phenomena by Ferdinand Keller. Keller refers to the works of Chaldni pointing out that the knowledge of the cosmic origin of meteoritic phenomena was achieved only recently at the beginning of the current [the 19th] century. Keller points to the recent meteorite falls in “Connecticut”, where an iron of 225 pounds dropped in 1807 and “Juvenas”, France, where a 220 pound stone fell in 1821. Keller speculates about the origin of these masses and suggests that these may be the remains of a once much larger heavenly body that existed between Mars and Jupiter and which became destroyed in some not yet known catastrophy. 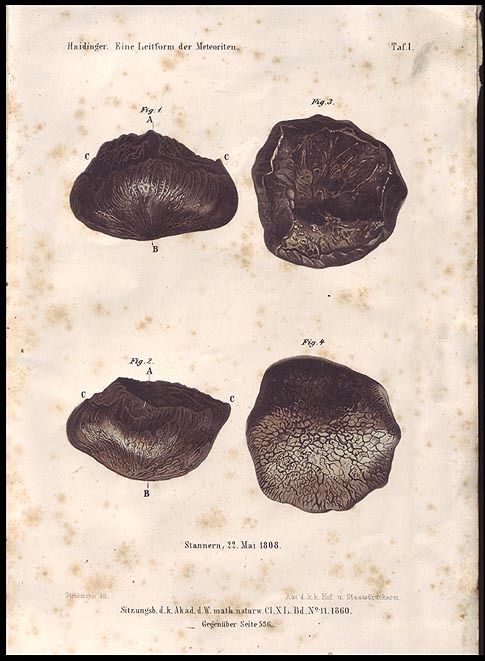 The copper engraving plate in Kellers work shows the main mass of the L’Aigle fall (upper left), a sample of the Stannern meteorite fall in Moravia which fell May 22 in 1808 (upper right) and a piece of the Pallas-iron (upper centre) which was shown to Pallas by Tartars in 1771 in Siberia. The two lower figures show an enourmous and long lasting multiple fireball which was seen to fall on July 3rd in 1762 in Saxony and Brandenburg and which detonated over the city of Potsdam. No meteorites were discovered according to Keller. Notice of Lion River, South Africa, Meteoritic Iron. By Charles Upharm Shepard, MD. And of Prof Clark’s Thesis on Metallic Meteorites. Extracted From The American Journal of Science And Arts, Vol. XV. Second Series. New Haven 1853. 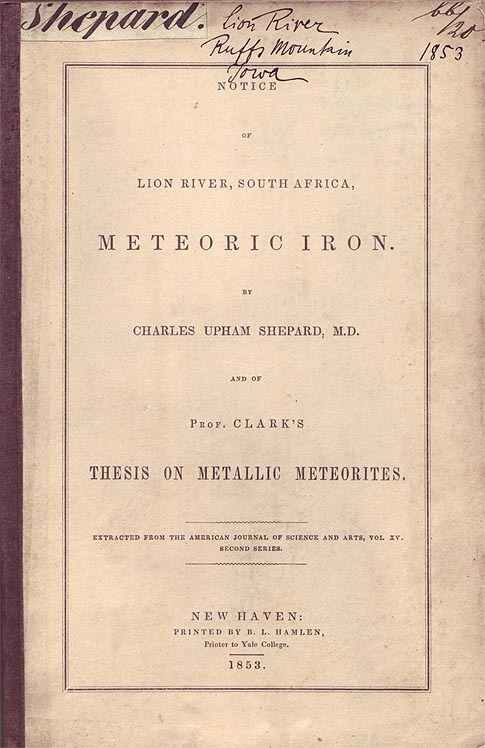 Shepard describes the circumstances of the discovery of a 178 lbs mass of meteoritic iron in a clay plain near Lion River and its transport by Mr. John Gibbs via oxe carts to Cape Town as well as its subsequent shipping to London, from where it was forwarded to Shepard via New York. When the iron arrived at Amherst College Shepard performed several experiments, determined the Ni content and etched two cut surfaces. Although the strewn field which would later be known as the Gibeon strewn field had already been reported by Captain J.E. Alexander in 1838 the Lion river mass was among the first, if not the first Gibeon meteorite ever, that was scientifically analyzed in the US. 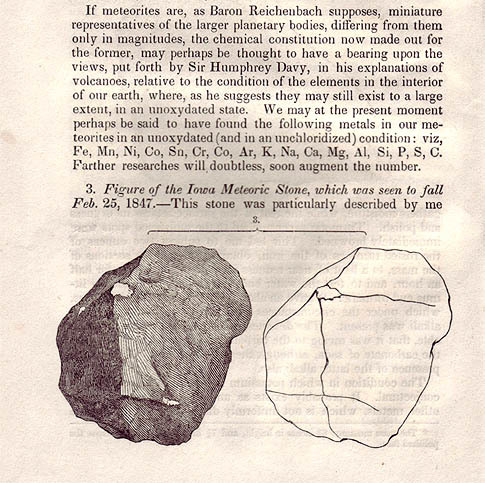 Shepard points out that his discoveries of unoxidyzed elements in meteorites back up the theory of Baron von Reichenbach that meteorites are “miniature representatives of the larger planetary bodies, differing from them only in magnitudes”. In the following Shepard describes the Iowa meteoritic stone which was seen to fall Feb. 25, 1847. 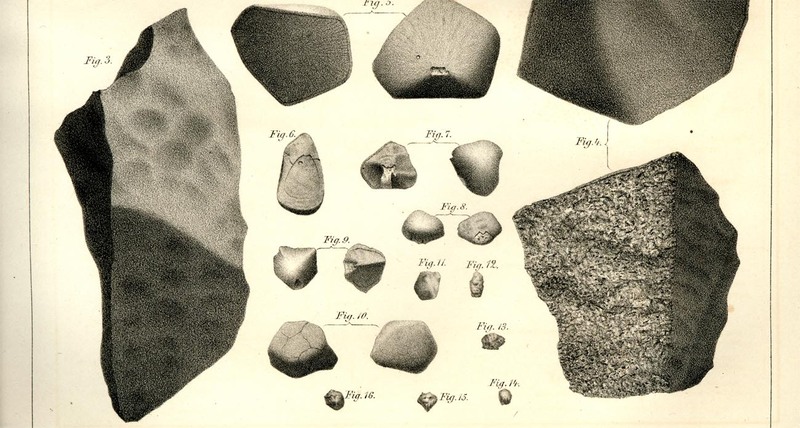 The below image shows the drawing by R. Bakewell that was produced on Shepard’s behalf because of the “uncommon completenss and perfection of form of this stone”. 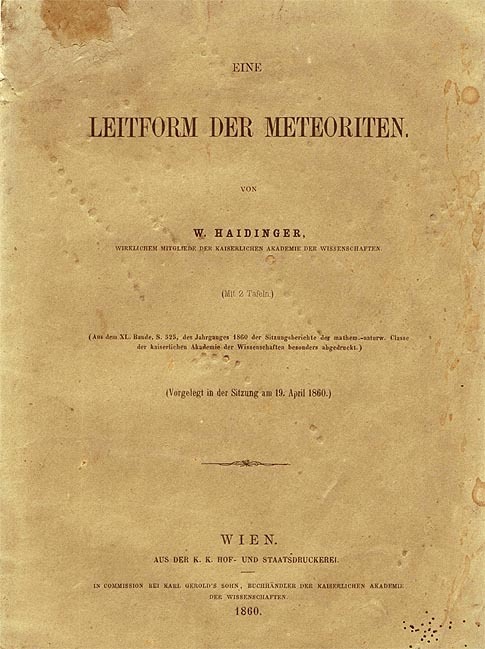 In his remarkable work, and by referring to earlier papers of Kenngott and Reichenbach, Haidinger draws a line from the physics of the meteoritic flight to shape and surface texture of individual meteoritic masses. In contradiction to other scientists of his time he comes to the conclusion that stone meteorites are already in their final shape and certainly cold when passing through the last several kilometers of earth’s atmosphere. “Leitform der Meteoriten” provides a comprehensive description of the processes responsible for shaping meteoritic rocks during the hot phase of the flight. The paper was among the first publications on this particular subject and suggests several ideas on fragmentation processes of meteorites that are accepted by science until present. On the basis of examples from the Stannern and the Gross-Divina meteorite falls, Haidinger describes the conditions under which certain meteorites can maintain a stable or semi-stable flight. The two plates picturing these oriented stones belong to the premium examples of the genre. The grade of detail in reflection of light and plasticity of surface texture of these colored drawings remained superior to any kind of photographical approach for more than hundred years. In fact the first photographical reproductions of meteorites in the last quarter of the 19th century meant a major step backwards for the depiction of meteoritic masses in science and literature.